Thala Beach Lodge is located on the northernmost headland of a 2km stretch of untouched coastline. The views from our restaurant are panoramic, taking in the Far North Queensland coast from Double Island to Cape Tribulation, and from the sparkling waters of the Great Barrier Reef to the World Heritage Forests that cover our coastal ranges. 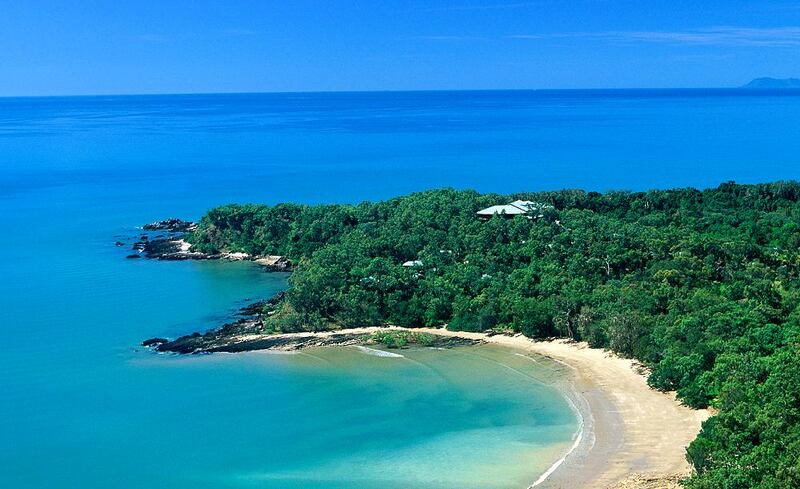 Thala is located 10 minutes, by regular shuttle, from Port Douglas. All tours in the Cairns, Port Douglas area pick up at the Lodge. All local specialist tours can be arranged for you after arrival. Photo copyright Thala Beach Lodge. Thala Beach Lodge is a privately owned five star luxury beach resort, situated 38 kilometres North of the city of Cairns and 16 kilometres South of the village of Port Douglas. Timber bungalows are scattered amongst a hundred and forty five acres of wooded headland and secluded beaches. It is one of the world's most beautiful private beach locations. The story of the natural history of Australia is unique and Thala nurtures this environment. Grass Trees sprout along pathways, their scaly black trunks topped with tufted grassy headdresses, stunted reminders of a land long ago. Slate paving, cut from a nearby quarry, show glimpses of Gondwana in fossils over 400 million years old. Pros: Upon arrival at the Thala Lodge, everything is put at ease as you are greeted with a welcome drink as your bags are brought to your own private bungalow. Showcasing a lush architectural design and fabulous staff, our stay at the Thala Lodge was among the highlights of our entire vacation in Australia. Featuring an exotic rock pool, various beach entries, and several on site activities, there was always something to do at the Lodge. Should you feel the need to do more, the staff is very knowledgeable and was able to offer additional options. Dining at the property was top notch, and was able to cater to food restrictions (ie gluten free, etc). Picnic basket dinning was even offered should one feel the need to have a small bite during their activity! Being in a secluded area, a shuttle service was offered for those wanting to go up to Port Douglas. Best be sure to know the shuttle times as you may find yourself paying for a cab or waiting for an extended time if you are to mess up! Cons: Enjoying our stay at the Thala Lodge, we have no major complaints. A few minimal issues we had were that small children were allowed in the dinning room, which is okay if the children would behave. However, when you are enjoying a several hundred dollar dinner and there is a kid running around and/or screaming at the table next to you, doesn't always make for the desired atmosphere! Additionally, the hot tub is heated by the sun during the day and very cold at night, which didn't help if you wanted to wind down and relax in the hot tub after a long day of participating in tours or traveling!